The EARS research space is a much-needed step forward into grappling with electro-acoustic music. 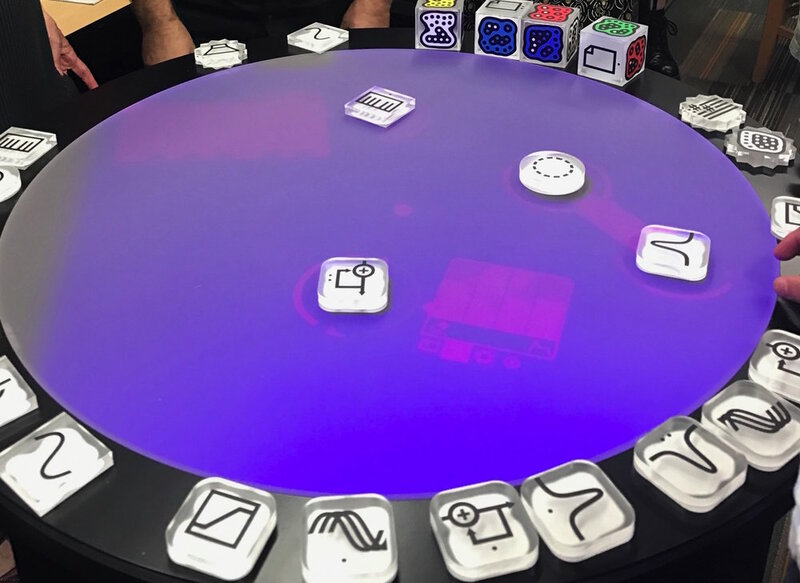 A Reactable, an interactive sound-design and music-making system, is among the high-end gear at EARS. Photo by Emili Earhart. Once just another classroom, room 2401 in UW-Madison's Humanities Building has recently been renovated and filled with a slew of electronic music equipment including performing and recording equipment, MIDI controllers, instruments and effects, and more. It's now called the Electro-Acoustic Research Space (EARS), which had its grand opening on September 15 with an open house led by Daniel Grabois, a Professor of Horn at the Mead Witter School of Music. The new space was funded in part by a $161,121 grant from the Wisconsin Alumni Research Foundation. "Research" is a key word here, and in this context, Grabois defines it as "rehearsing, improvising, and experimenting." Visitors at EARS' September open house playing the space's new Minimoog synthesizer. Photo by Emili Earhart. At the open house, Grabois walked visitors through a new array of top-of-the-line tools available for listening, recording, performing, manipulating, and tinkering. EARS serves as both a space for these activities as well as a home for additional sets of recording and performing equipment for students to use in other spaces, while leaving plenty available for those using the room at the same time. This gives the students who use it the freedom to record and perform in an intentional space on or off campus with the university's gear—speakers, mixers, interfaces, microphones, headphones, cables, computers equipped with Pro Tools, and so on. The space itself is much more of a learning environment, with not only practical gear such as effects pedals (with specific microphones/mutes to use with their respective instruments), but also gear not necessarily for performance, such as the somewhat-novel but pretty intriguing interactive table workstation known as Reactable—essentially a learning tool for sound design and furthering one's listening skills. EARS also offers a Moog theremin and Minimoog synthesizer, and Ableton controllers to cater to students who wish to cultivate a knowledge of live production. UW's recently renamed Mead Witter School of Music has its share of innovative and adventurous faculty members, but has never exactly advertised itself as a place to engage in electronic and electro-acoustic performance. There seems to be a hard line drawn between the more traditional music schools, such as UW-Madison's, and new music or "Contemporary Performance" programs, such as the Manhattan School of Music's (where Grabois served as chair of the Department of Contemporary Performance before coming to UW). It is frustrating that "new music" is so often boxed into its own category, as if working with electronic music technology is all that different from practicing a Beethoven Sonata. Performing is all about listening anyway, so why not seize the opportunity to break down the sounds produced on one's instrument by, say, visualizing the sound on Pro Tools or exploring synthesis with a Moog? That would give students the capacity to really consider the sounds making up the notes, harmonies, and themes in that Beethoven Sonata. Moreover, the student will have taken their musical knowledge even further through exposure to digital and analog tools. Up until the establishment of EARS, UW-Madison didn't offer music students that many ways to engage with electronics, at least without using their own gear or a professor's personal gear. (The Dance Department actually offers an interesting and useful course on sound design). At one point, Grabois and trombone professor Mark Hetzler did provide an opportunity for students to receive credit for electro-acoustic performance. Their short-lived student ensemble, called $2 Broom, encouraged students to improvise and compose open-ended works for any instrumentation, plus whatever electronics Grabois, Hetzler, and the students had. The downfall of $2 Broom was mostly due to a lack of gear and space available for multiple students to work on material at once. Grabois plans to revive $2 Broom now that EARS has launched. Several students, many from the percussion department, as well as on-campus new music ensembles such as Sound Out Loud, have taken it largely upon themselves to explore and perform electro-acoustic work on their own as well. I graduated from the Mead Witter School of Music this past May with a degree in Piano Performance, and while I missed the boat on $2 Broom, I worked with a couple of students involved in the ensemble and performed once on campus in an electro-acoustic trio. For that project, Hetzler let us use his speakers and mixing board until one of the musicians acquired his own. Other than that, we all largely used our own electronic equipment and instruments, including a used Arturia Minibrute synthesizer I'd recently bought from a Madison musician. Working with synths, pedals, other electronic musicians, and essentially setting aside time to be creative outside piano translated directly into my understanding of piano and the other instrumentalists and vocalists with whom I collaborated in school—because, again, it's all about listening. Likewise, these electro-acoustic experiments have translated into my current musical projects, solo and with musicians in town unaffiliated with the School of Music. Integrating electro-acoustic music into music schools' curriculum, encouraging students to experiment, and providing technological resources is crucial to making sure that students learn meaningful lessons about sound, whether one plans to buy a synth or master the traditional repertoire of their chosen instrument. High-end recording technology is important for auditions, and having access to speakers and microphones allows for a whole world of electro-acoustic repertoire to add to a student recital. Being able to simply run your instrument through your choice of a dozen or so effects pedals can yield a new way of listening to that instrument. And utilizing EARS, even just during a practice break, to experiment with a synthesizer or Ableton for the first time might inspire a student to take new musical paths. The relatively small introduction to electro-acoustic music that I received from the School of Music (of course, I was focusing on piano and am grateful for my instruction in that field) paled in comparison to what I learned about electronic music from the thriving Madison music community. Hopefully, students recognize how much of a privilege it is to have the access to this technology and the faculty involved, and will venture out of the practice room sometime and up to EARS in room 2401.